As much as local communities in Colorado may want to ban the process, their hands are tied. 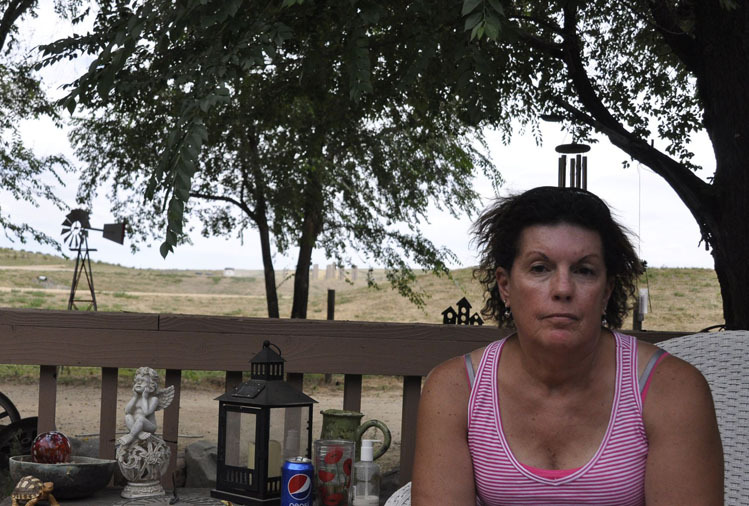 Susan, a lung cancer survivor, breathes in fumes and dust from fracking operations right near her home. Can you taste it? I can actually taste it before I can smell it,” said J.D. Ruybal, 59. We were in a field outside of Windsor, Colorado, where he has lived for nearly three decades, staring down—and whiffing—a fracking well. Rybal calls himself a Colorado “gasman—raised by natural gas.” He worked in the fields for years until he got injured on the job and was no longer able to work; he now carries a cane. Now Ruybal is a critic of fracking and a self-described “pro-democracy” advocate working with a grassroots group, Coloradans for Community Rights, to get an initiative onto the state ballot in November that would ensure local self-governance, including the right to ban fracking. He was taking me on a behind-the-scenes tour of Weld County, home to nearly half of the state’s active fracking wells, which boomed in Colorado in 2009. The tour—conducted in an old Dodge Intrepid with tornado-inflicted dings and dents—passed wellheads nestled in residential developments, gas flares, pipelines, suburbs, wheat fields and lakes. All beneath the Rockies’ inscrutable gaze. In Weld County, corporate influence has steamrolled the political structure, leaving residents without a voice. Local communities sought to amend the state’s constitution to establish local control over fracking. Oil lobbyists, pro-fracking legislators, and American Legislative Exchange faced down a local bid to ban fracking. Fossil fuels have been a staple of Weld’s economy for decades, and since fracking took off about seven years ago, the county saw one of the largest drops in unemployment nationwide—a stat the industry loves to tout. But fracking is, at best, a mixed blessing. Hydraulic fracking is the energy-intensive process of blasting deep rock formations with large quantities of water, chemicals and “frac sand,” in order to liberate gas. It has been widely described as a “cleaner” alternative to oil and coal, and as a “bridge fuel” to a green-energy future. But as the process has spread nationwide, it has been shown to cause earthquakes, contaminate drinking water, and contribute to local air pollution and potentially catastrophicclimate change. Weld County made headlines when in 2013 unprecedented flooding broke an oil pipeline, ruptured oil storage tanks and inundated abandoned wells. An old-style “nodding donkey” pump jack on private land in Weld County, Colorado. Though it has created many jobs, the conditions for workers are often dismal, Ruybal said. Extraction is done by layers of subcontractors, who are typically looking to cut costs with little concern for workers’ protections. Last year, the U.S. Occupational Safety and Health Administration fined Halliburton for what the agency called “serious” violations in Weld County that killed one and injured two. Ruybal told me that in an unrelated event involving a separate company, a man told him he had been pulled into a frac sand conveyor belt and gravely injured after he said he tried to get a failing handle replaced, to no avail. While Colorado’s fracking regulations are heralded by the industry as the nation’s most stringent—proof that fracking can be done safely—many local communities want nothing to do with the process. But many other communities support fracking. According to a 2013 Quinnipiac poll, Colorado voters back fracking 51%–34%, with Republicans and Independents more likely to support it than Democrats. However, a 2014 poll also showed that Coloradans strongly support local control and stricter regulations over the process. As much as a local population may wish to ban fracking or contain the damage in its community, their hands are tied. In Colorado—as in many other fracking states across the country—the power of a city or county to make its own rules about fracking has been trumped, or “preempted,” by the state, an idea that was confirmed by the Colorado Supreme Court earlier this year. “The mayor and governor both tell us we can’t do anything about it,” said Ruybal. By 2012, some activists were turning to the local ballot initiative process—by which citizens write, petition for and vote on legislation—to assert some control over fracking in their area. The ballot initiative process is one of the few forms of direct democracy in the U.S. (Only 24 states have a process for citizen lawmaking, although it is in common use at the local level.) 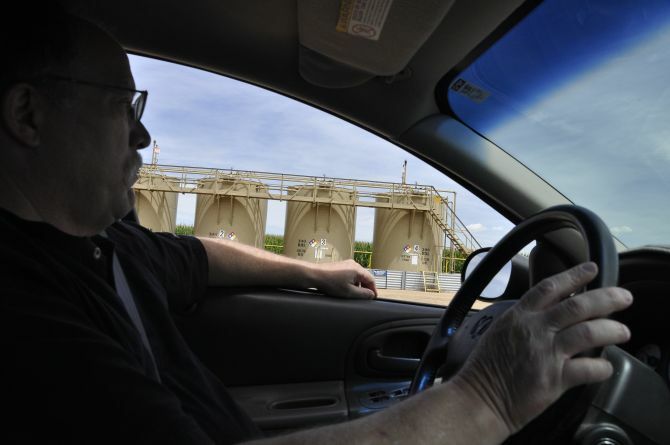 In 2012 and 2013 at least five Colorado localities passed moratoria, bans or stricter regulations related to fracking. The industry, together with the state attorney general, quickly pushed back, filing lawsuits claiming that local laws violated the state’s supremacy over oil and gas regulation and infringed on fracking corporations’ Fifth Amendment protections against being deprived of property without due process. “We just want to be able to put the issue to a vote,” said Ruybal, who said local officials didn’t allow his group to collect signatures for what would have been effectively a fracking ban in Windsor, where the mayor has endorsed fracking as in the public interest. Nearly identical local measures have been approved in other areas. Like many other “fracktivists,” Ruybal concluded that the only option left was to change the state constitution to enshrine local control over extraction via the state ballot initiative process. This turn toward direct democracy has brought the debate to a fever pitch. The industry has spent millions of dollars since 2014 to flood the airwaves with pro-fracking messages. And for some employees, the topic is shrouded in fear. After emailing an industry employee information about the dangers of radon exposure, Ruybal said that the worker never emailed back. “He showed up on my porch and [said,] ‘Don’t be emailing me anything like that. Next time, make a copy, give it to me, but don’t ever email me,’” Ruybal said. Another woman told me that she did not want her or her baby included in this story, for fear that her husband, who works for the industry, would lose his job. The landscape, once brimming with sagebrush and wild turkeys, was elevated and flattened to accommodate the wells. Now it drained onto Susan’s property, inundating her basement and flooding her mudroom in 2013. The industry did pay for repairs to her house after the floods, she says, though the repairs were only finished this year. The passing truck drivers paid little heed to the speed limits meant to keep dust down, and backing-up alarms were not turned off. “Who even cares that I’m sitting here,” Susan said. “So I go inside.” Still, she said, “I’m pro-oil and gas, there’s nothing else I know how to be. I’m just upset by the way we’ve been treated. When it happens next to you, you think about it differently. Ruybal, a former member of the Windsor City Planning Commission, first got involved when the industry started to frack in Windsor’s residential neighborhoods, despite zoning laws. “An industrial use in a residential area?” he said. “That alarmed me.” Since then he has been on the front lines, gathering signatures for the latest ballot initiative, paying visits to people like Susan, cataloging oil and gas spills and meeting with organizers from across the state. He is not alone. 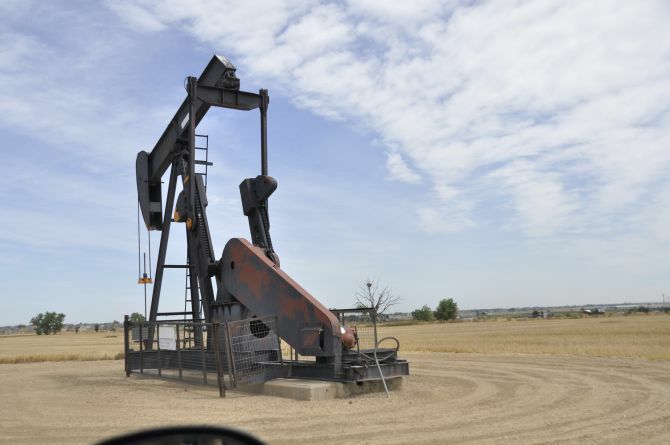 The Community Rights Amendment ballot initiative is one of three measures aimed at fracking that activists are attempting to get on the November ballot. It would upend the state’s constitutional power to preempt a local government’s attempt to increase regulatory protections—not only on fracking but on issues like the minimum wage. Two other anti-fracking initiatives are being pushed by Coloradans Resisting Extreme Energy Development (CREED), a more mainstream environmental group backed by national groups like Food & Water Watch. One measure targets the state’s power over local governments, but only regarding fracking; the other would increase the distance required between new wells and homes, hospitals, and schools to 2,500 feet; it is currently 500 feet. Taking in the sights on Ruybal's "fracking tour" of Weld County, Colorado. Many anti-frackers believe that 2016 offers them their last, best chance to protect their communities. But if recent history is any guide, it’s a long shot. The connections between industry, with its deep pockets, and the state’s leadership get more deeply entwined each year. And an industry victory last year imposed onerous requirements on the ballot initiative process, increasing the challenges faced by anti-industry advocates. In January 2015, legislation was introduced in the Colorado House of Representatives, to tack “fiscal impact” statements onto all future ballot measures. The bill, HB 1057 had been drafted by Colorado Concern—comprising industry executives, corporate law firm partners, university presidents and other business CEOs. These statements highlight an initiative’s impact on short-term state revenue. No positive or nonfiscal impacts—such as those involving human or ecosystem health, safety or tourism—are required. The reform would also create new mandatory fiscal hearings for petitioners, adding yet another hurdle before they could begin gathering signatures. Other than Democratic Gov. John Hickenlooper and a few Democrats in the House, support split along party lines, with Republicans in favor and Democrats against. In his January 2015 State of the State address, Hickenlooper announced that “fiscal responsibility” for ballot measures would be a priority for the four-months-long legislative session. After a hard-fought 138 days of lobbying, the bill’s powerful proponents garnered support from the few Democrats needed to get it through the House. At that point the bill was an assumed shoo-in, as the Senate’s slim Republican majority was expected to quickly rubber-stamp it. But when votes were cast, the bill was defeated—by a single vote. First-year Republican Chris Holbert had apparently not gotten the memo. An audible outcry from the lobby was heard, legislators report. The co-sponsor of the bill rushed to consult with the rookie, who then reversed his vote, and the bill was passed. The celebration was on. Correspondence between Colorado Concern and Hickenlooper’s office shows the pro-industry group sending the governor’s office a list of organizations and people for the governor to invite for the bill signing. “An invite from the Gov’s office is meaningful—so if you’d like to send something out, and then we can follow up also that’s great,” Colorado Concern’s then-CEO Tamra Ward wrote to a governor’s staffer. Industry has been quick to respond with its own measures. A new group called Building a Better Colorado and a leading pro-fracking spokesperson are pushing a ballot measure to make it much harder to amend the state constitution via the ballot process, as the anti-fracking measures aim to do. This initiative would require that petitioners gather signatures from 2% of registered voters from all 35 state senate districts and that amendments pass with 55% of the vote. These requirements would not only greatly increase the cost of gathering signatures but also give a single county veto power over any initiative. Although the battle is being fiercely fought in Colorado, fights over fracking—and preemption—are part of a larger national strategy that places the ballot initiative process in the crosshairs. Throughout the country, industry-affiliated politicians are working hand in glove with the American Legislative Exchange Council (ALEC), a network of corporate donors and state legislatures with strong ties to the Koch brothers, whose oil and chemicals empire is a leading funder of climate denialism. In 2015, the group highlighted the fact that Hickenlooper had presented the obscure issue of fiscal impact statements as urgent state business. 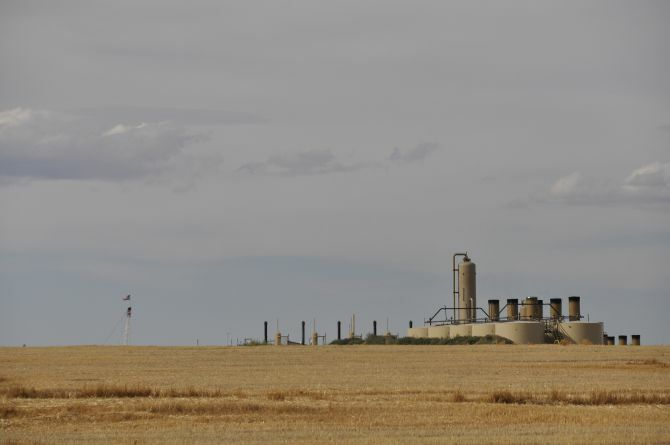 Fracking infrastructure in Weld County, Colorado. Also last summer, Ohio’s secretary of state, Jon Husted, removed three county fracking bans from their local ballots. He (and his industry-affiliated lawyers) argued that local citizens should not have the right to vote on issues, like fracking, over which the state claims supremacy. It was a new legal argument that would have quashed the state’s anti-fracking movement. Though the argument was struck down by the state Supreme Court, Husted won the case on a technicality and the initiatives were removed. The same legal argument about state preemption has cropped up in recent years in Washington state, Oregon and Missouri to block cities and counties from voting on local workers’ rights bills, local GMO bans and local minimum wage increases. Over the past three years, legislators who are closely tied to ALEC have also passed ballot initiative reforms in Arizona, Arkansas, Michigan, Missouri, Nevada, Ohio, Oklahoma and Utah. And in Michigan, where the volunteer-led Committee to Ban Fracking in Michigan has been working since 2012 to get a fracking ban on the state ballot—they are currently collecting signatures to qualify for the 2018 ballot—a reform was signed into law in June that shortens the signature-gathering window. If upheld in court, the law will succeed in preventing the ban from reaching the ballot. The bill was pushed by legislators tied to ALEC and supported by the Michigan Oil and Gas Association and the Michigan Chamber of Commerce. Why the huge investment? The industry is afraid that if an anti-fracking measure even reaches the ballot in Colorado, belief that local self-government is a realistic political goal could spread, as copycat marijuana initiatives have. “I hate to say that their efforts work,” said Ruybal, “but they really do.” Desperate to stop an activist victory from becoming an example, they are targeting the direct democratic process itself. This article was reported in partnership with The Investigative Fund at The Nation Institute, with support from the H.D. Lloyd Fund for Investigative Journalism and the Investigative Journalism Committee of the Fund for Constitutional Government. Simon Davis-Cohen is a freelance investigative journalist from Northeast Portland, Oregon.